Daniel Escoriza (2014): Natrix natrix (Linnaeus, 1758). In: Martínez, G., León, R., Jiménez-Robles, O., González De la Vega, J. P., Gabari, V., Rebollo, B., Sánchez-Tójar, A., Fernández-Cardenete, J. R., Gállego, J. (Eds.). Moroccoherps. Amphibians and Reptiles of Morocco and Western Sahara. Available from www.moroccoherps.com/en/ficha/Natrix_natrix/. Version 7/12/2014. Accessed 25 Apr 2019. Global range map of Natrix natrix according to the IUCN. The genus Natrix forms a monophyletic genus which is distributed throughout most of the Western Palaearctic region, from the subarctic region in Scandinavia to the margin of subtropical deserts in northern Africa. In this ecozone appear three species (considering N. megalocephala as invalid species; Jandzik 2005), and the three occur also in North Africa: N. maura and N. natrix in the Maghreb and N. tessellata in isolation in the Nile Delta (Sindaco et al., 2013). N. natrix is the most widespread species of the genus, and shows more phenotypic diversity in the Mediterranean basin, being the southwestern clade (astreptophora) located at a more basal phylogenetic position (Guicking et al., 2006; Fritz et al., 2012). According to Mertens (1947) in North Africa would occur the Iberian Peninsula subspecies N. natrix astreptophora, characterised by a uniform gray color and the absence of nuchal-occipital ring in adults. However Sochurek (1979) proposed that the North African populations should be assigned to a new subspecies, N. natrix algirus, because the North African specimens do not show a gradual loss of nuchal-occipital ring during ontogenetic development. A beautiful snake of moderate size, which can reach 120 cm in length, although there may be larger specimens (Bruno & Maugeri 1990). Based on specimens of the Rif and the Atlantic coast of Morocco: head not clearly distinct from the body, with rounded pupils and red iris. Cephalic scales large and distinct. Seven supralabials, third and fourth in contact with the eye, white and trimmed in black. The North African specimens may show a nuchal ring more or less apparent in adulthood. Robust body with keeled dorsal scales. Dorsal coloration olive gray background with an alternating pattern of oval spots, or without any pattern. Belly whitish with dark spots in alternating pattern. Young specimens with a marked nuchal-occipital ring. similar to the astreptophora phenotype present in the Iberian Peninsula. 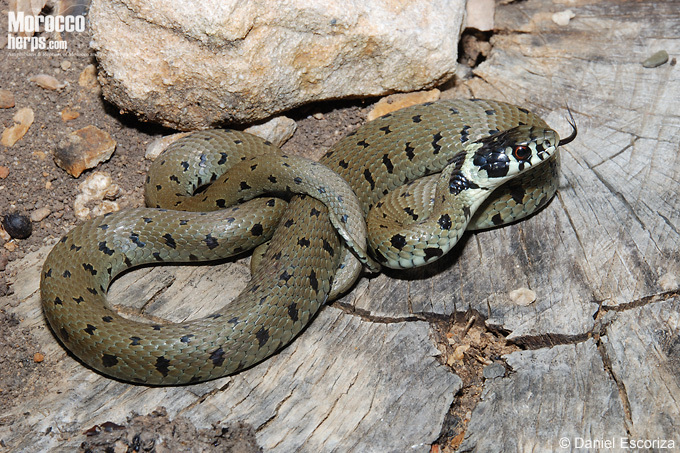 Juvenile from Jebala, showing some of the typical features of N. natrix that easily separated this species from N. maura: posterior cephalic scales dark, contrasted nuchal collar and a dorsal pattern relatively uniform, although alternating scattered black spots. Photo: © Daniel Escoriza. The specific ecology of the species in northern Africa is poorly known (Schleich et al., 1996; Bons and Geniez, 1996). Overall it is a species relatively linked to wetlands and their surroundings, but can be found far away from the water. It feeds on larvae of amphibians, fish and adult amphibians, which can capture on land, particularly toads, sometimes even large individuals. Natrix natrix predating on Amietophrynus mauritanicus. Rif. Photo: © Ahmed Idrissi. In Morocco, the activity may continue for much of the year and I have seen active young specimens to late November in elevated areas of the western Rif. In most of these places it appears sympatrically with N. maura, with which might appear trophic competition (Luiselli, 2006). N. natrix is distributed by the Mediterranean regions of North Africa, usually limited to sub-humid and humid ombroclimates (rainfall above 500 mm/year) in mountain areas in the Rif and Middle Atlas (Fahd and Pleguezuelos, 1992), where it reaches up to 2,000 m (Bons and Geniez, 1996). However locally it can also occur in lowlands, as in the Moroccan Atlantic plain (Mateo et al.. 2003; Escoriza et al., 2012) and in northern Tunisia (around Lake Ichkeul), favoring the moist microclimate maintained by riparian forests. 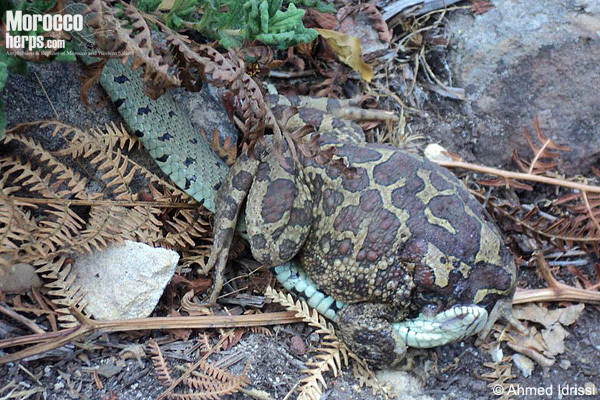 In Morocco the distribution of N. natrix can be associated with a humid Mediterranean chorotype, which typically occupy some "relict" species with Eurasian affinities such as E. orbicularis (Mediani et al., 2009), C. girondica (Real et al., 1997) and amphibians as P. varaldii (Hamoumi and Himmi, 2010; Escoriza and Ben Hassine, 2013) and A. maurus (Marquez et al., 2011). Meso-thermal cork oak forest, typical habitat of N. natrix in Morocco (Jebala mountains). The habitat occupied by this species in Morocco is highly variable, as occurs in the Iberian Peninsula (Braña, 1998). This snake can occupy open habitats, such deltaic marshes and extensive agricultural lands, but also areas of dense vegetation, such as meso-thermal forests of holm and cork oaks, usually associated with the close presence of permanent and seasonal ponds, streams and springs. N. natrix is scarce in Morocco and elsewhere in North Africa (Doumergue, 1901; Schleich et al., 1996; Escoriza et al., 2012). Several factors may adversely affect populations of this species, such as the destruction of riparian forests and alteration of aquatic habitats, which directly affect this snake and the amphibian populations on which it feeds. 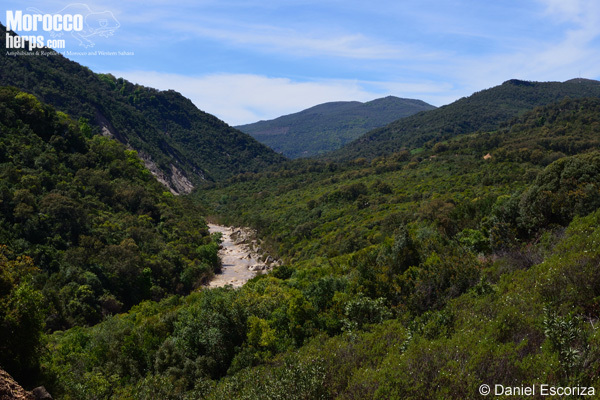 However some of these populations are in protected areas such as Sidi Boughaba and Jbel Bouhachem reserves, which can promote the survival of this interesting species, at least in these sites. Bons, J., Geniez, P. 1996. Amphibiens et reptiles du Maroc. AHE, Barcelona. 320 pp. Braña, F. 1998. 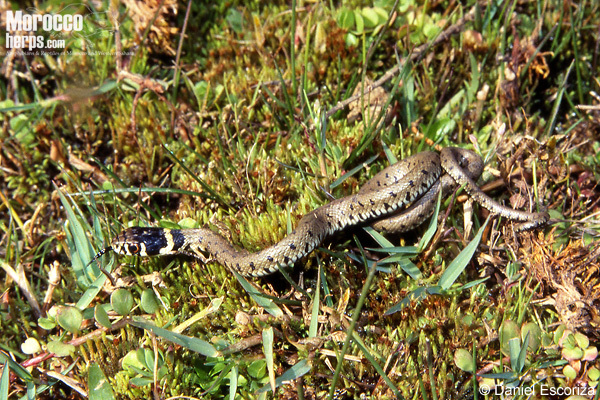 Natrix natrix (Linnaeus, 1758). In Fauna Ibérica. Vol. 10. Edited by M.A. Ramos. Museo Nacional de Ciencias Naturales, CSIC, Madrid, Spain. pp. 454–466. Bruno, S., Maugeri, S. 1990. Serpenti d'Italia e d'Europa. Mondadori, Milano. 225 pp. Doumergue, F. 1901. Essai sur la faune erpétologique de l'Oranie: avec des tableaux analytiques et des notions pour la détermination de tous les reptiles & batraciens du Maroc, de l'Algérie et de la Tunisie. L. Fouque, Oran, 404 pp. Escoriza, D., Fuentes M.A., Comas, M.M. 2011. Natrix natrix (Squamata:Colubridae) presence in Sidi Boughaba Ramsar Reserve (Northwestern Morocco). Bulletí de la Societat Catalana d’Herpetología 19: 120-121. Escoriza, D., Ben Hassine, J. 2013. New record of Pelobates varaldii in the region of Ben Slimane (northern Morocco). Herpetological Bulletin 124: 26-27. Fahd, S., Pleguezuelos, J.M. 1992. L’Atlas des Reptiles du Rif (Maroc): résultats préliminaires. Le Bulletin-Société Herpétologique de France, 63: 15–29. Fritz, U., Corti, C., Päckert, M. 2012. Mitochondrial DNA sequences suggest unexpected phylogenetic position of Corso-Sardinian grass snakes (Natrix cetti) and do not support their species status, with notes on phylogeography and subspecies delineation of grass snakes. Organisms Diversity & Evolution, 12:71-80. Guicking, D., Lawson, R., Joger, U., Wink, M .2006. Evolution and phylogeny of the genus Natrix (Serpentes: Colubridae). Biological Journal of the Linnean Society, 87: 127-143. Jandzík, D. 2005. 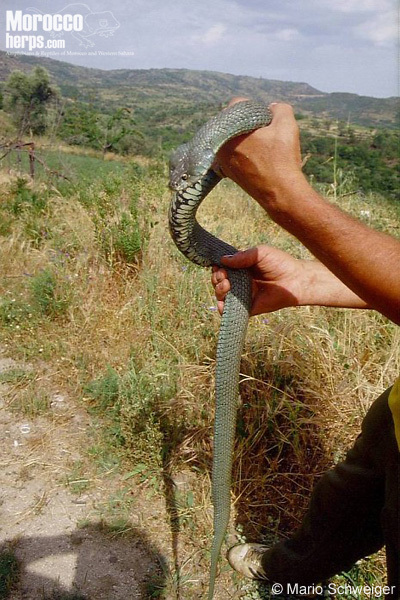 Record of a black-coloured Natrix in northeastern Turkey, with comments on the validity of the bigheaded grass snake, Natrix megalocephala Orlov & Tunijev, 1987. Zoology in the Middle East, 34: 27-34. Luiselli, L. 2006. Resource partitioning and interspecific competition in snakes: the search for general geographical and guild patterns. Oikos, 114: 193-211. Márquez, R., Beltrán, J. F., Slimani, T., Radi, M., Llusia, D., El Mouden, H. 2011. Description of the advertisement call of the Moroccan midwife toad (Alytes maurus Pasteur & Bons, 1962).Alytes,27: 142-150. Mateo, J.A., Pleguezuelos, J.M., Fahd, S., Geniez, P., Martínez-Medina, F.J. 2003. Reptiles y Anfibios de Ceuta y su entorno. Instituto de Estudio Ceutíes, Ceuta. 388 pp. Mediani, M., Amezian, M., Tattou, M. I., Benhoussa, A., Idrissi, H. R., El Agbani, M. A., Qninba, A. 2009. Nouvelles citations de deux espèces reliques paléarctiques, Emys orbicularis Linnaeus, 1758 et Vipera latastei Boscá, 1878 dans la Péninsule Tingitane (Rif occidental, Maroc).Bulletin de l’Institut Scientifique, Rabat, 31, 99-102. Mertens, R. 1947. Studien zut Eidonomie und Taxonomie der Ringelnatter (Natrix natrix). Abh. Senckenb. naturforsch. Ges. 476: 1-38. Real, R., Pleguezuelos, J. M., Fahd, S. 1997. 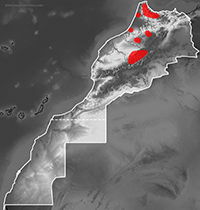 The distribution patterns of reptiles in the Rif region, northern Morocco. African Journal of Ecology, 35:312-325. Schleich, H.H., Kästle, W., Kabish, K. 1996. Amphibians and Reptiles of North Africa. Koeltz Scientific Books, Koenigstein. 630 pp. Sindaco, R., Venchi, A, Grieco, C. 2012. The Reptiles of the Western Paleartic. Ed. Belvedere, Latina. 543 pp. Sochurek, E. 1979. Die Schlangen Nordafrikas. Mitt. Zool. Ges. Braunau 3 (8/9): 219-226.